“I want Pancakes for breakfast” — my 5 year old tells me as soon as he wakes up from deep slumber on a bright sunny morning. And another demand is quick to follow ” Mamma, I want Blueberry Pancakes” !! I was stunned but also pleasantly surprised at the specific request. We don’t get fresh blueberries where we live, so I always keep some dried blueberries at home for times like these. They taste just as good in pancakes and dry fruits are anyways good for children as well. So, bingo !! Double benefit ! In a large bowl, sift together the flour, sugar, salt, baking powder and baking soda. In a separate bowl, beat the eggs with the buttermilk and melted butter. Using a spatula, combine the dry and wet ingredients to make a thick, lumpy batter, taking care not to over mix. In a nonstick skillet, melt some butter/oil over medium-high heat. Ladle ⅓ cup of batter into the hot skillet and sprinkle with blueberries (If you are making multiple pancakes on a large skillet, allow space between pancake because they will puff up). When bubbles appear on the surface of the pancakes and the edges begin to brown, flip pancakes and cook the other side, about 2-3 minutes per side. I also added a bit of sprinkles on my son’s demand. MAKES A STACK OF 12 HAPPY PANCAKES. 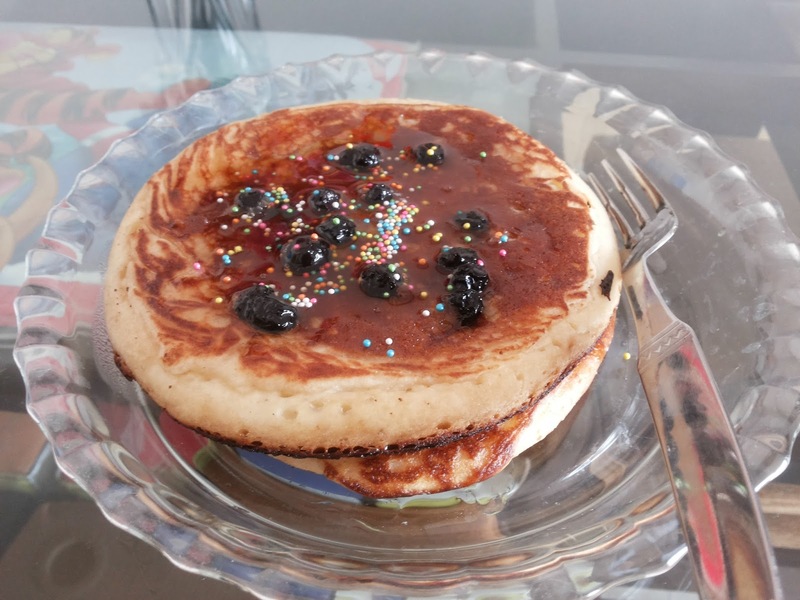 There are many other variations of Pancakes that you can make, so be creative !